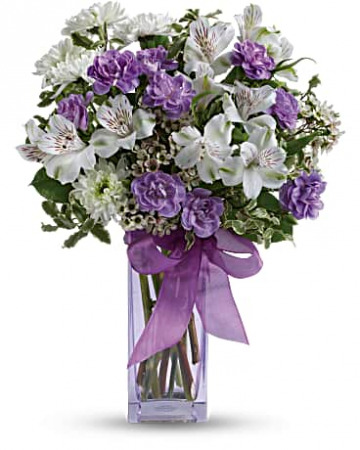 Spread the love, spread the laughter, with this perky lavender and white arrangement! Bursting with snow-white alstroemeria, lavender carnations and delicate waxflower, this bouquet is finished with a glistening lavender ribbon for an extra special touch. 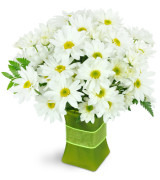 Offer them a bouquet blooming with fresh from the garden appeal. 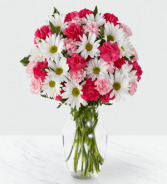 Pink roses, carnations, mini carnations and gerbera daisies and lush greens. 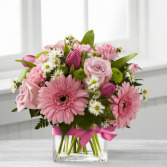 Gorgeously arranged in a clear glass cube vase accented with a pink satin ribbon, this bouquet is a soft and graceful way to send your warmest sentiments.